When it comes to choosing a fast graphics card, there are two main options: AMD and Nvidia. There are a number of factors that set them apart, and this is doubly so on Linux. On Windows, speed is the only thing that matters — Nvidia GPUs (graphical processing unit) tend to be faster than AMD. But on Linux, there are other things to keep in mind. There are two types of drivers you can install to get your graphics cards working, namely proprietary drivers Should You Use AMD Proprietary Graphics Drivers & How Do You Install Them? [Ubuntu] Should You Use AMD Proprietary Graphics Drivers & How Do You Install Them? [Ubuntu] If you have an AMD or nVidia graphics card or chip in your desktop or laptop, you have some serious graphics processing power under the hood. However, these highly respected graphics vendors like to keep... Read More or open source. While there are good and bad aspects to both, they differ if you’re using a Nvidia or AMD graphics card. While there are open source and proprietary Nvidia drivers for Linux, there’s really only one viable option at this point in time: the latter. nouveau, the open source driver for Nvidia cards, tends to have poorer performance than its proprietary counterpart. Much of the work done by nouveau is through reverse engineering the proprietary Nvidia driver. It’s similar to how the Wine project How to Run Windows Apps & Games with Linux Wine How to Run Windows Apps & Games with Linux Wine Is there any way to get Windows software working on Linux? One answer is to use Wine, but while it can be very useful, it probably should only be your last resort. Here's why. 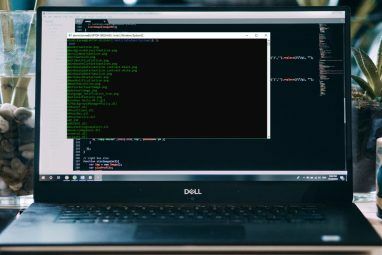 Read More recreates a Windows environment to run programs like Microsoft Office How to Install and Use Microsoft Office on Linux How to Install and Use Microsoft Office on Linux Linux is great, but how on earth can you install Microsoft Office without running into problems? Here's what you need to do. Read More in. Basically, developers look at the results of a program and work backwards from there. This has its drawbacks, mainly on the speed and compatibility fronts. nouveau is much, much slower than the proprietary Nvidia drivers, especially with newer graphics cards. Support for the newest Nvidia products is also quite lacking — it takes a lot of time to recreate. nouveau also lacks something that the proprietary driver has: reclocking. This allows the GPU to work harder, and thus perform faster (at the cost of more power). Unfortunately, only a few Nvidia GPUs Nvidia Graphics Cards: Which One Is Right for You? Nvidia Graphics Cards: Which One Is Right for You? Nvidia graphics cards are the most popular for a reason. But which model should you buy and why? We explain the jargon, the cards, and their performance. Read More can use this with nouveau installed, none of them very new. The difference in speed is plain silly at times, especially for newer graphics cards. Some benchmarks show that the proprietary drivers can perform up to nine times faster than their open source counterparts. Suffice to say, nouveau is suitable for drawing your desktop, but gaming has a way to go. That being said, some specific Nvidia graphics cards work decently with them, so your mileage may vary. For the most part, it doesn’t really matter which kind of drivers you install for AMD graphics cards. They’re well supported across the board, though using open source Defeat Planned Obsolescence with Linux and Open Source Software Defeat Planned Obsolescence with Linux and Open Source Software Unlike a 5-year-old PC, a 5-year-old smartphone can barely run any modern apps. But there is a way to enjoy the benefits of technology without buying new hardware: embrace Linux and free software! Read More drivers is the preferred method. In fact, there are many cases where the open source drivers (AMDGPU for newer cards, and Radeon for older ones), are on par with their proprietary counterparts or even faster! 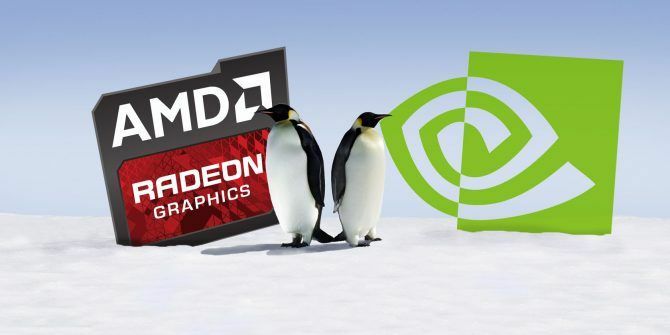 Compared to Nvidia’s open source driver, nouveau, there is far better support Open Source AMD Graphics Are Now Awesome, Here's How To Get Them Open Source AMD Graphics Are Now Awesome, Here's How To Get Them The AMD proprietary driver on Linux is fast but buggy, and the open source driver has now become awesome Read More for newer graphics cards. In fact, support for AMD’s next generation of graphics cards, Vega, is already being developed. This is partially due to AMD’s support for the open source community, providing documentation and manpower for driver development. That being said, while the drivers are decent across the board in the AMD camp, your performance will still be noticeably slower than using a Nvidia graphics card with proprietary drivers. Unless, of course, things change soon What Is So Good About the New AMD Ryzen? What Is So Good About the New AMD Ryzen? The AMD Ryzen just landed, and the world of CPUs just got interesting. What is the hype all about, and is it right for you? Read More . There’s also the matter of acquiring a system with AMD graphics in the first place, which may be a bit of a challenge. Also known as NVIDIA Optimus or AMD Switchable Graphics, they’re technologies that lets you choose between using a high-performance (Nvidia/AMD) graphics card, and a less power hungry one (usually Intel). This is very useful for laptops when you’re away from a power port and want your battery to last 7 Simple Tips to Improve Your Linux Laptop's Battery Life 7 Simple Tips to Improve Your Linux Laptop's Battery Life How can you squeeze more time from your battery and enjoy a truly portable Linux computing experience? Read More . While both work rather well on Windows, on Linux, it’s definitely easier to set up using AMD (with a few exceptions). For starters, there is no true Optimus support for Nvidia graphics cards, and this is doubly the case if you’re using proprietary drivers. The main way of getting this feature to work is using a program called Bumblebee. While it’s not officially endorsed by Nvidia, it works fairly well. However, there is a bit of setup required to make it work. It runs as a separate program service How to Control Linux Start-Up Services and Daemons How to Control Linux Start-Up Services and Daemons Linux runs many applications "in the background" that you might not even be aware of. Here's how to take control of them. Read More , which usually needs a manual install to get running. A lot of bugs have cropped up with the service as well, having not been updated in a few years. For everything else, there’s PRIME, which allows for graphics switching for open source drivers, such as nouveau and AMDGPU. Being built in with these drivers, it’s much easier to set up in comparison, no extra software required. That being said, this is only really a problem for laptops How To Find The Best Laptop Under $600 How To Find The Best Laptop Under $600 If you know where to go, $600 can get you a lot of laptop. Here's what you should be looking for. Read More — it’s a non issue for desktop computers. In which case, you’re free to choose whatever graphics card you like, without worrying about power usage. And performance wise, Nvidia wins hands down. Along with this, some Linux operating systems work around these problems with Nvidia, using special tweaks to make graphics switching a little easier. For example, Ubuntu has its own control panel What Switching Back to GNOME Means for Ubuntu What Switching Back to GNOME Means for Ubuntu Canonical has announced the end of the Unity desktop. From Ubuntu 18.04, the GNOME desktop will be restored. What does this mean for Ubuntu, and its relationship with Linux users? Read More which lets you choose between using Intel or Nvidia’s graphics card (but only after logging back in). Put shortly, Wayland How To Try Wayland, A New Display Server For Linux How To Try Wayland, A New Display Server For Linux Linux distributions will soon get a new display server called Wayland. Let's take a look at Wayland, and see how you can try it out right now. Read More is seen as the future of the Linux desktop, aiming to eventually replace the X display server. It aims to make development much easier, among other modern innovations. It’s already available on two major Linux desktops: GNOME and Plasma KDE Explained: A Look at Linux's Most Configurable Desktop Interface KDE Explained: A Look at Linux's Most Configurable Desktop Interface What does Linux look like? Sometimes, Unity; other times, GNOME. Oftentimes, though, Linux runs KDE. If you're not using the erstwhile K Desktop Environment on your Linux PC, now is the time to change! Read More . At this point in time though, Nvidia’s proprietary driver only works with GNOME’s implementation of Wayland, due to its slightly unique design. Wayland needs a desktop environment Which Linux Desktop Environment Best Suits Your Personality? Which Linux Desktop Environment Best Suits Your Personality? What kind of computer user are you? Do you leave icons scattered across your desktop? Do you prefer to work in one uncluttered application? Let's find out which Linux desktop environment suits you best. Read More that supports compositing, a technique which prevents graphical artifacts like window tearing. They do this by keeping multiple copies of your screen in memory at once. To move these copies to memory, compositors for Wayland need to use a special API (application programming interface) What Are APIs, And How Are Open APIs Changing The Internet What Are APIs, And How Are Open APIs Changing The Internet Have you ever wondered how programs on your computer and the websites you visit "talk" to each other? Read More , implemented by the graphics driver. The API that’s currently in use the most is called GBM (Generic Buffer Management). So long as you’re using an open source driver (AMDGPU/Radeon/nouveau), Wayland will work. Nvidia’s proprietary driver however, uses a different API, called EGLStreams. Many compositors don’t have support for this, the GNOME desktop GNOME Explained: A Look at One of Linux's Most Popular Desktops GNOME Explained: A Look at One of Linux's Most Popular Desktops You're interested in Linux, and you've come across "GNOME", an acronym for GNU Network Object Model Environment. GNOME is one of the most popular open source interfaces, but what does that mean? Read More being the major exception. While this may change in time, you can’t really do much (except stick with the X display server for now). While Wayland is still very much in development, it’s clearly going to become more and more important. Fedora 5 Reasons to Use Pure Open Source Distro, Fedora 5 Reasons to Use Pure Open Source Distro, Fedora Fedora isn't as well known as Ubuntu, and has a reputation for being hard to use. But if this is true, why do so many people continue using Fedora? Read More , for example, already ships with it (though since it uses GNOME by default, Nvidia drivers won’t be a problem). At this point in time, the only graphics card provider you can absolutely be sure to work is Intel’s integrated graphics. While they may not be that fast, they’re actually much better Integrated vs. Dedicated Graphics Card: 7 Things You Need to Know Integrated vs. Dedicated Graphics Card: 7 Things You Need to Know Wondering if you should use an integrated vs. dedicated graphics card? Here's what you need to know to make your decision. Read More than they once were in terms of speed. They’re also very battery friendly in comparison to Nvidia or AMD’s graphics cards. Support for them will definitely be out of the box, their drivers being fully open source on Linux. Many games are also quite playable, if not as well as dedicated graphics cards. You’re also assured to have Wayland working if you wanted to test it out, due to its open source nature. For Linux desktop computers, it’s a much easier choice to make. Nvidia easily has the fastest graphics cards on the market at this point in time (so long as you’re using their proprietary drivers). 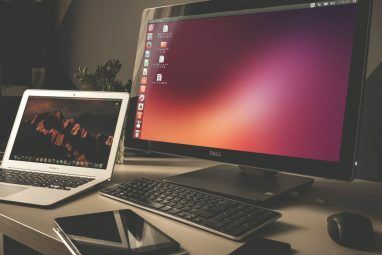 It’s a different story on laptops 5 Awesome Linux Laptops You Can Buy Right Now 5 Awesome Linux Laptops You Can Buy Right Now Linux is amazing, unless it won't install. Then it just hurts. Fortunately, a number of laptop makers build Linux laptops that don't suffer from any driver or software faults. Read More though, due to having a battery life. In this case, it’s a harder decision to make. Getting switchable graphics to work is rather difficult on Nvidia’s proprietary driver How to Install Proprietary Graphics Drivers in Ubuntu, Fedora, and Mint How to Install Proprietary Graphics Drivers in Ubuntu, Fedora, and Mint Most of the time, you'll be fine with open-source software on Linux. But if you want real gaming and graphical power, you'll need proprietary drivers. Here's how to get them. Read More , though not impossible. 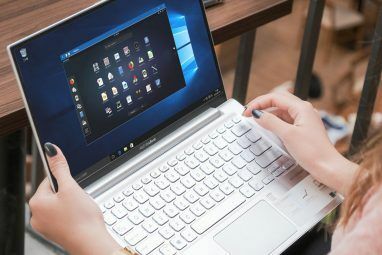 Plus, unless more desktop environments become compatible with Nvidia’s quirks on Wayland, it may mean using a desktop that’s not your preference. In the end, it’s a matter of deciding what you’re prepared to deal with. AMD graphics cards have better out of the box support, but can also be slightly slower than Nvidia’s offerings. And Intel easily has the best support out of the three (but is the slowest). What would you choose? Why? Explore more about: Drivers, Graphics Card, Linux. An excellent article, although it's over a year old now and could do with some updating. Either that, or you could write a follow up to explain the current state of affairs between AMD and Nvidia on Linux. Lots of things have changed, like the inclusion of the AMD drivers (modules) in the 4.15 kernel (and above, of course). This means you can plug in an AMD GPU in (for example) Kubuntu 18.04, and not have to install anything! After 10 years of Nvidia on Linux, I've finally decided to switch to "Team Red" (AMD). I'm just so sick and tired of having to grapple with the proprietary Nvidia drivers, and I hate the way Nvidia treats the Open Source community. Just one example: this article touches on the subject of "re-clocking". The nouveau team have been quite successful in reverse engineering firmware for the older Nvidia cards, but they cannot use the same methodology for the 900 and 1000 series Nvidia cards because the firmware on these is signed! This is the reason why you can get an old computer with a GTX 750 and nouveau running faster than a modern computer with a GTX 1080 and nouveau. Just to explain: without the ability to re-clock, the modern cards use the clock speed that is set when they power up, which is very, very, very slow. Nvidia have really dropped the ball with their latest proprietary 390 and 396 Linux drivers. Games aside, the desktop performs like a pig. Even the open source nouveau drivers (without re-clocking) handle a composited desktop better. And since I spend more time in the Linux desktop that I do in Linux games, this is extremely important to me. The proprietary Nvidia drivers are so bad that I've parked Linux gaming for the time being, and am now using the Intel HD 4600 iGPU on my old Core i7-4790. Even the low-powered Intel iGPU handles the Linux desktop much better than the proprietary Nvidia drivers! Things are much "smoother" and much more responsive (as as I mentioned above - I spend much more time in the Linux desktop than I do in Linux games). This is the reason why I'm switching to AMD. I had no idea AMD were being so awesome and cooperative with the Linux community, and I had no idea how far their open source (and even closed source) drivers have progressed. This has been a real eye-opener for me, and a very tangible lesson about why "open" (FOSS) is better than "closed" (proprietary). With the latter, you are beholden to a third party - a faceless corporation that really couldn't care less about a minority segment of its users. I don't game so both of my AMD graphics are older 8000 series. I use the open source ones on two desktops and both work just fine for what I do. Fact is even AMD dropped support awhile ago for a APU with a 8510G GPU and a 5545m CPU in a Mini ITX board. So having open source drivers is not a big deal. Definitely AMD for my desktop and integrated Radeon on my notebook. Because they provide open source drivers. Too bad AMD won't open-source EPYC's Platform Security Processor Code. Security through obscurity is BS: Your security is a cat in a box that you can't open — but it's OK, because the box says the cat is alive and well. The proprietary microcode, few seem to understand, running on these SoCs confirms the need for transparency. Not at all would I feel safe with an AMD or Intel brain stem. And mobile devices are rolling with a Qualcomm back-brain and brain stem — it's getting harder and harder to breath. That's Orphan Black-Black jacked. Here's a Dell link regarding Optimus issues and an official workaround for the Latitude e6420. That's right. I mentioned in the article how Ubuntu has a custom workaround for switching between Nvidia and Intel graphics. It even has its own control panel to choose which one you want to use. The main drawback of it is that unlike PRIME or Bumblebee, you need to log in and log out of your current session for the switching to apply. Plus, it's an Ubuntu-only solution. Don't you mean "...log out and log in..."? Syncthing or Resilio Sync: How Should You Share Files on Linux? Binary vs. Source Packages: Which Should You Use?